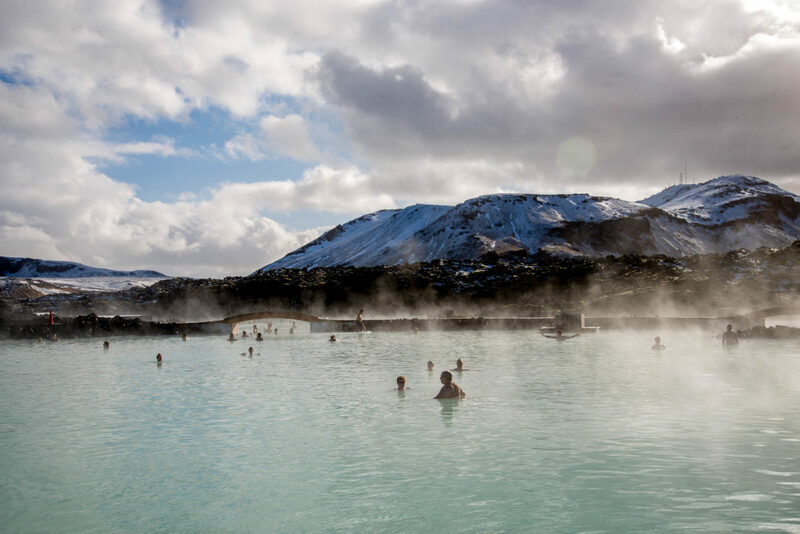 Cristi was dreaming about a trip to Iceland for a while now, thus he made it quite easy for me when it came time to buy him birthday gifts: I decided to surprise him with two tickets to Iceland. 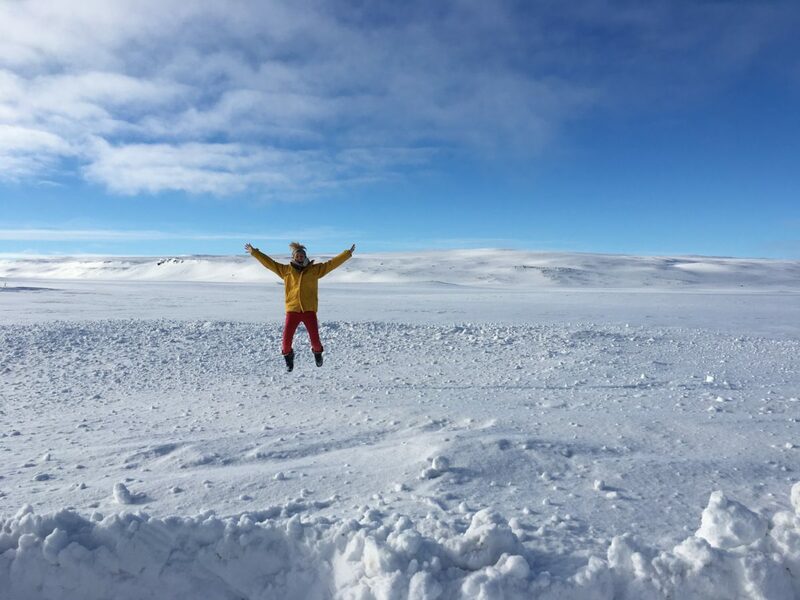 A lot of people visit Iceland during winter months to see the Northern Lights or during the summer for spectacular landscapes but we decided to go in the beginning of March. Why? We don’t know, simply because we could. Two friends, Romanian girls, that we’ve met during our stay in France joined us in this adventure, coming all over from Madrid and Cluj-Napoca. 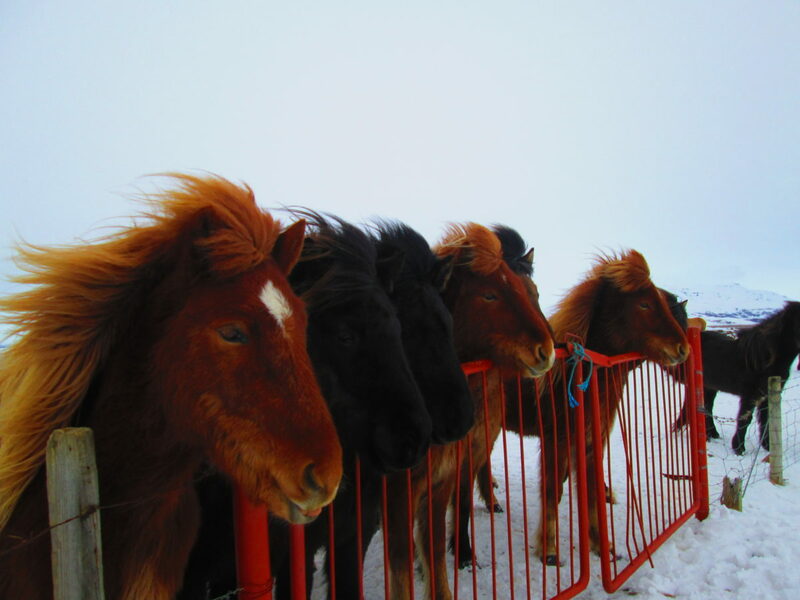 Since Iceland is renowned for accommodations filling up fast, we decided to book accommodation for all the nights in advance. 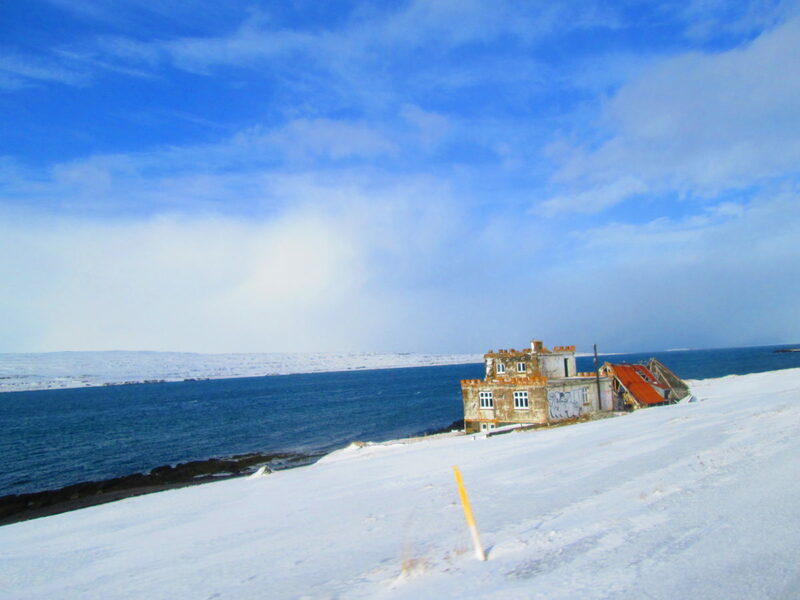 It was a good decision since in January the few Airbnb places that were available in East Iceland and the Westfjords were already booked. 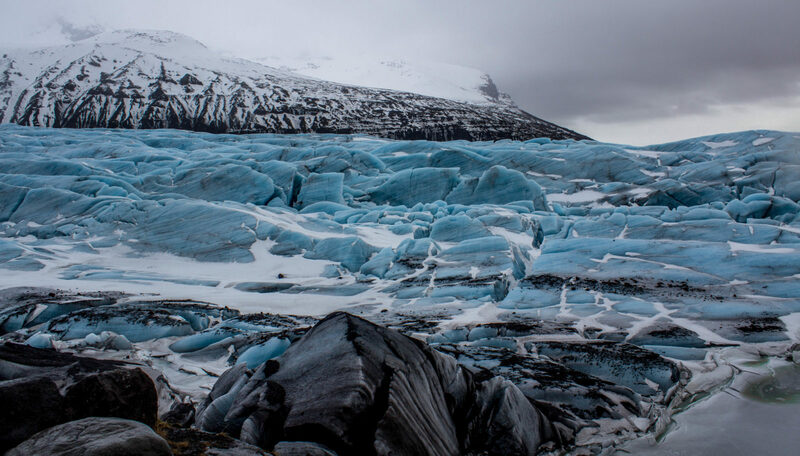 We knew from the start that a road trip along the Ring Road will expose us to roaring waterfalls, active volcanoes, horses, geysers, mountains, stunning landscapes and rough weather so we set our expectations high and this adventure didn’t disappoint us. Instead of using the traditional way of renting a car with a company, we decided to rent it through AirBnb and we didn’t regret our choice. We were initially supposed to receive a Toyota Rav4 but in the end we found ourselves in the possession of a handsome Nissan Pathfinder which turned up to be suitable for the unpredictable weather that we encountered. Gabi, the girl coming from Madrid, decided to spend some days discovering the beauty of London before our big adventure began, thus the three of us took the same flight. 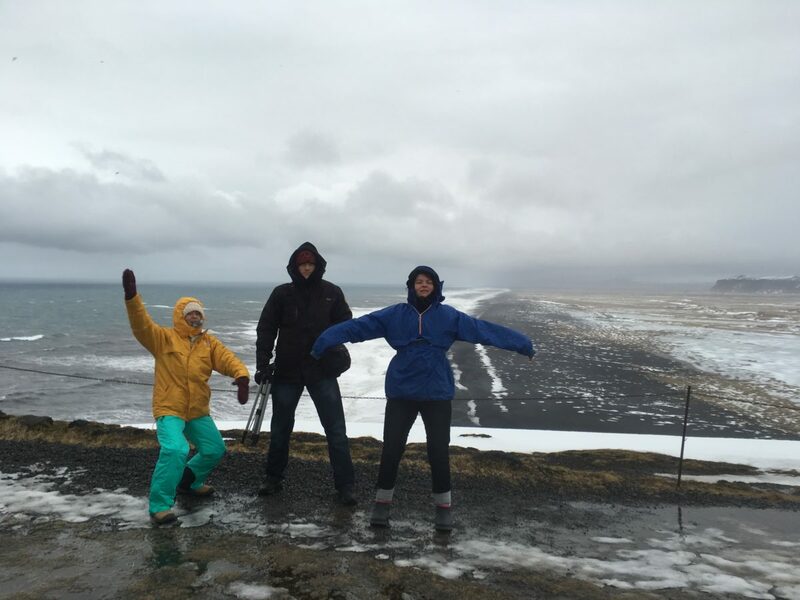 We landed at Keflavík Airport and with the blood rushing through our veins, excited that we put foot on Icelandic land, we took the bus towards Reykjavík from where we were supposed to pick up the car. After we took the Beast (this is how we called the car during our trip, since it is quite big compared to regular cars. 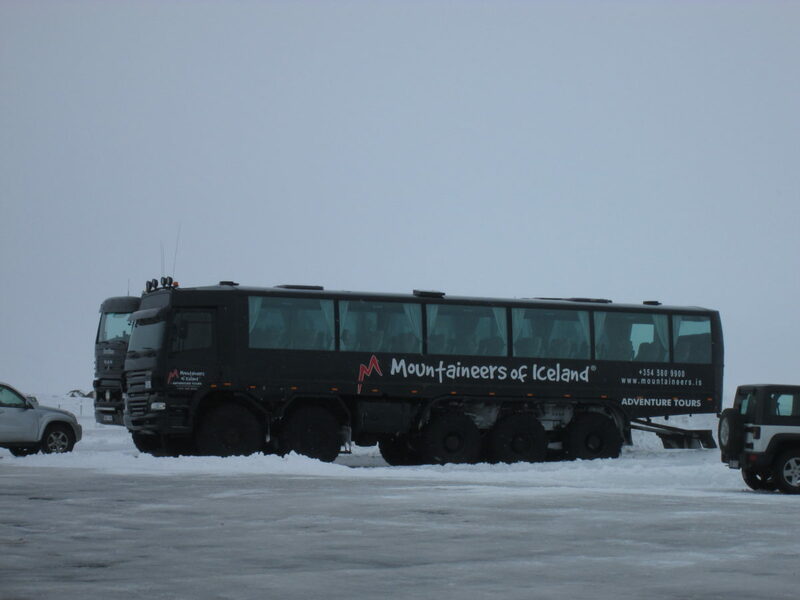 Little did we know that most cars around Iceland are SUVs and even cars similar to monster trucks.) we headed to the apartment we rented for the firsts two nights. By the time Lia (coming all the way from Cluj Napoca) arrived it was already past 8pm so we decided to go out and have dinner. We ended up walking around half an hour through snow until we finally found an American restaurant where we feasted with juicy burgers, drank Icelandic beer and reminisced of our time spent together in France, previous travels and caught up with each other. 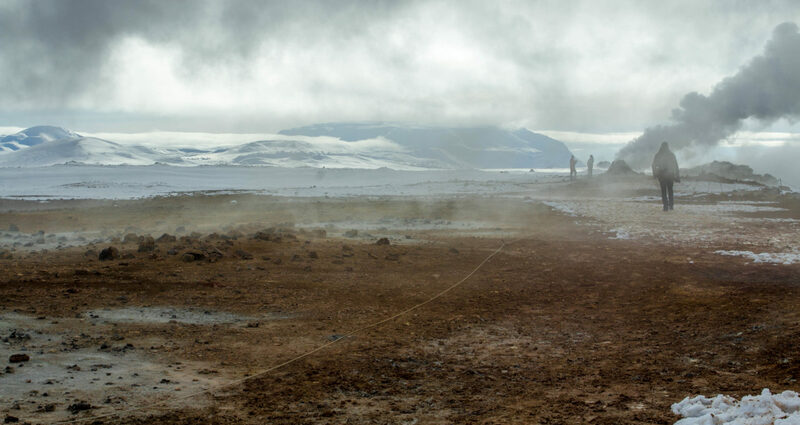 We also discussed a few things that stood out during our arrival to Iceland. A lot of people seem to have a gas barbeque on their balcony and their cars are mostly SUVs. 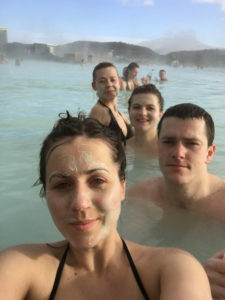 Oh, and the hot tap water has a strong sulphuric smell, especially in Reykjavik – keep that in mind when you are showering – it is normal. 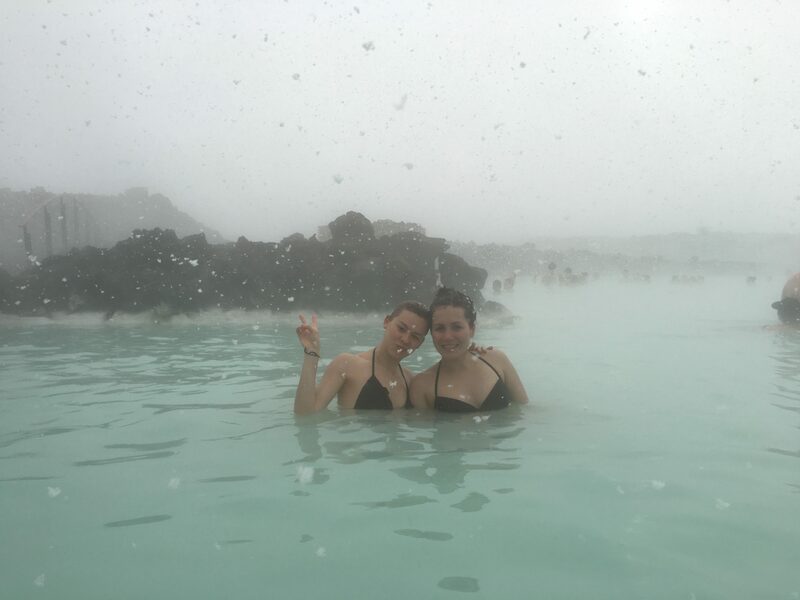 Blue Lagoon is located approximately 45 minutes drive from Reykjavik and it was a must in our trip. 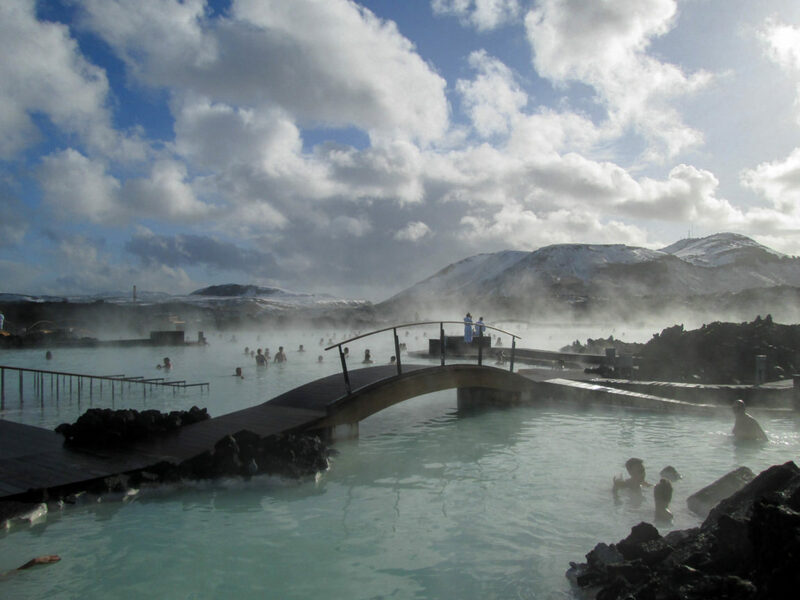 We could describe what the Blue Lagoon is but chances are if you’ve heard of Iceland you’ve heard of the Blue Lagoon. 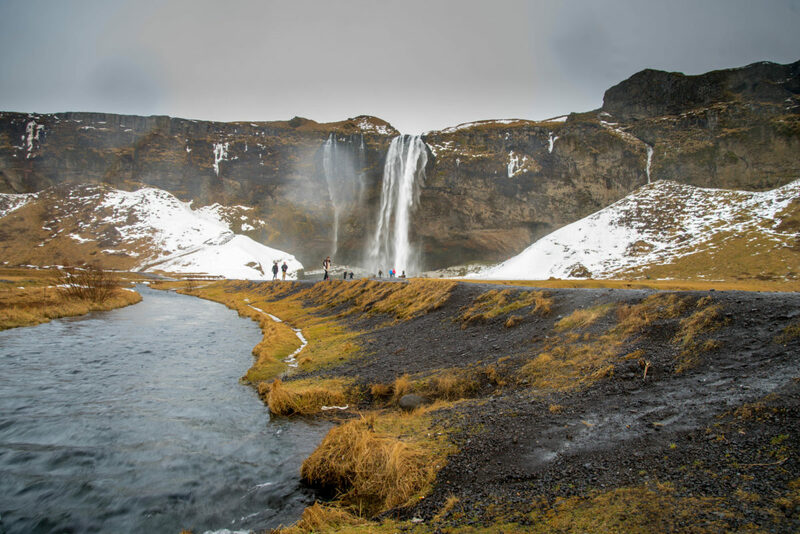 Moreover, no words would do it justice, so if you decide to visit Iceland, we strongly recommend taking the time to check this off your list. We allocated more than half a day for our lagoon visit and we booked in advance our tickets. I recommend you to pre-book your ticket no matter if it’s high or low season in order to secure your entrance. You also benefit of a discount if you book it online on their website. Outside, the weather was quite cold but the moment we set foot in the water everything started to feel more like a fairy tale in which we were the main characters. 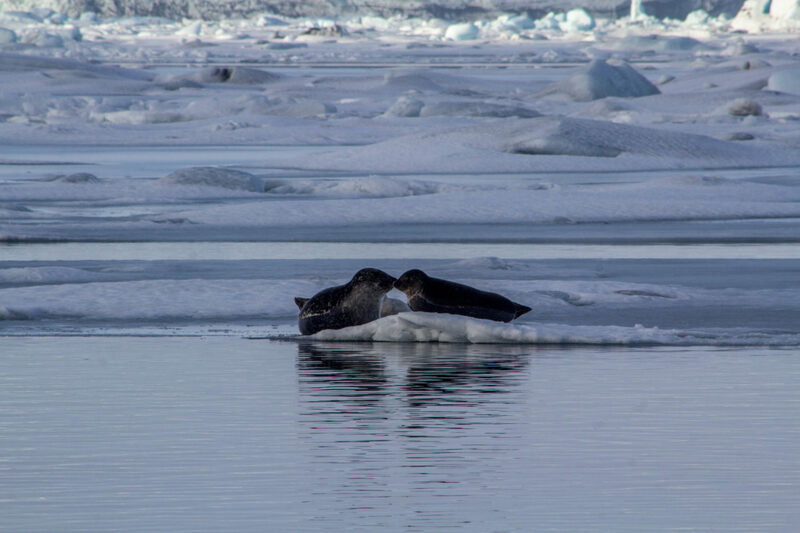 We were quite lucky because we had sun most of the time but there was also a snow storm while we were melting in the hot water which made this moment even more magical. 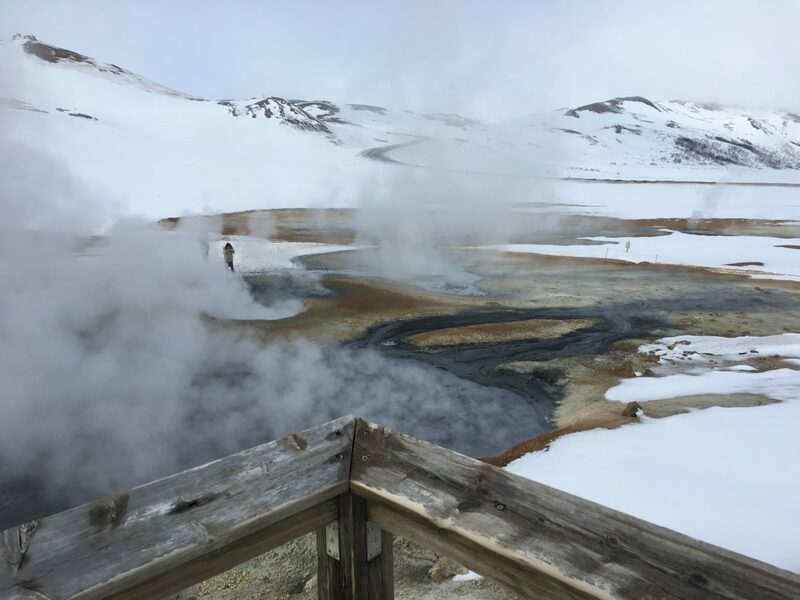 The mix of hot and cold, turquoise mineral rich water, steam, sun, snow, bar in the middle of the lagoon, all of this contributed to a once in a lifetime experience that none of us will ever forget. We woke up early in the morning and we decided to stock up on groceries before we left for our adventure just in case there aren’t too many supermarkets on the road. 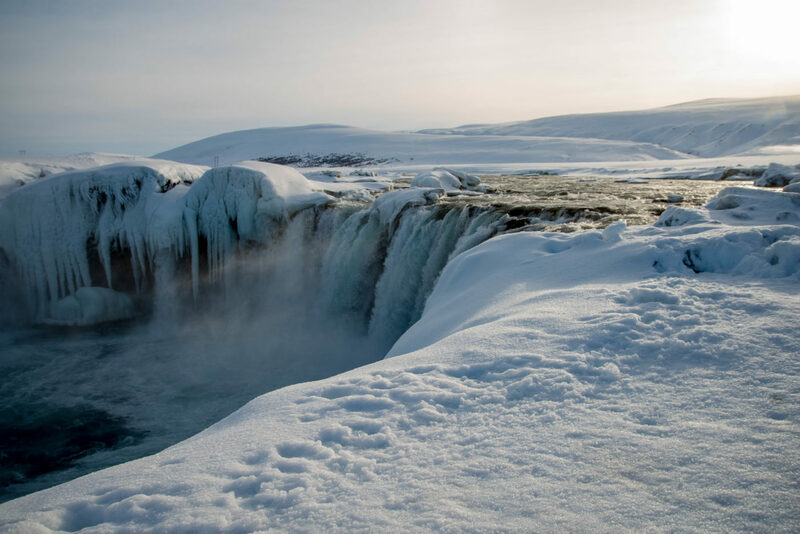 The famed Golden Circle can be done in one day and it’s a great place to start your Icelandic adventure, just make sure you bring extra memory cards for your camera and a warm jacket. While we were there the temperatures were not that low, but in most viewpoints the winds were extremely strong, in some places Cristi couldn’t even set up his tripod for pictures due to them. On the road we stopped as any other tourist for the first but not the last time, for about 10 minutes to pet Icelandic horses in our way to the first attraction of the day. 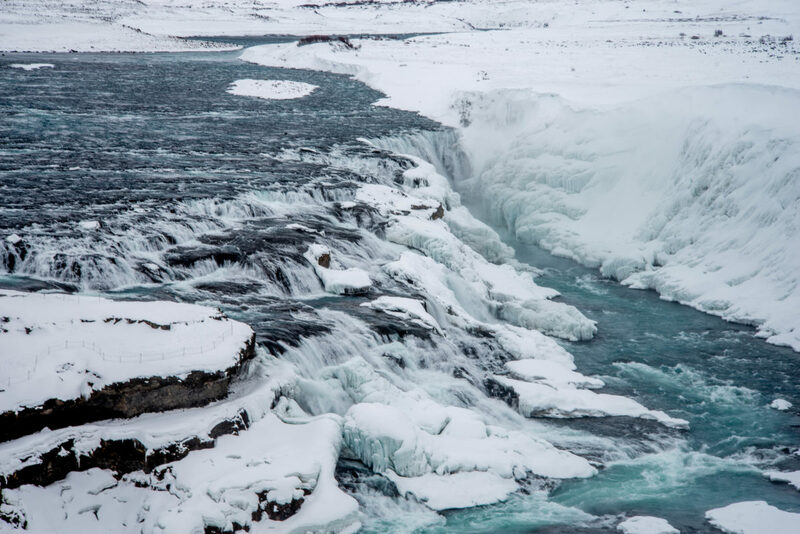 Here is the place where the tectonic plates of North America and Europe are ripped apart and you can cross from one continent to another or dive in between the two in either the Silfra rift or Davíðsgjá rift. The place was stuffed with tourists, the paths were icy and hard to cross but the view was worth it, even if we had to buy crampons in order to be able to climb the trails. 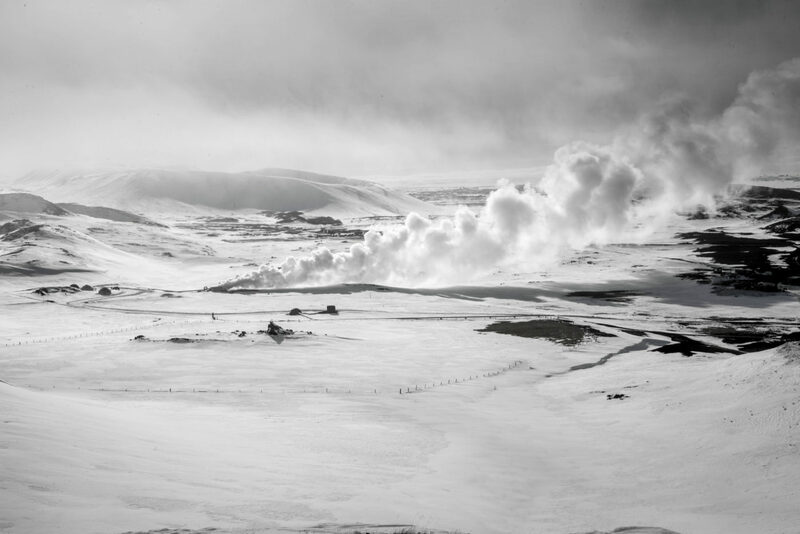 This geothermal area is about 60 km away from the National Park. 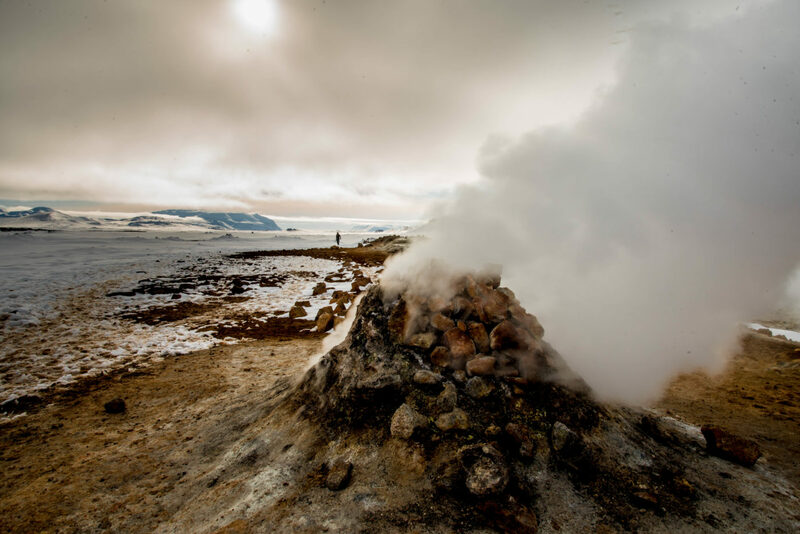 There are two famous geysers in Haukadalur called Geyser, from which the term “geyser” originated and which now is dormant and Strokkur the highest in the area which constantly explodes every 10 minutes and can reach 30 meters. The show lasts like 3 seconds thus you can choose if you want to take a picture or to see the eruption. I would recommend the latter. 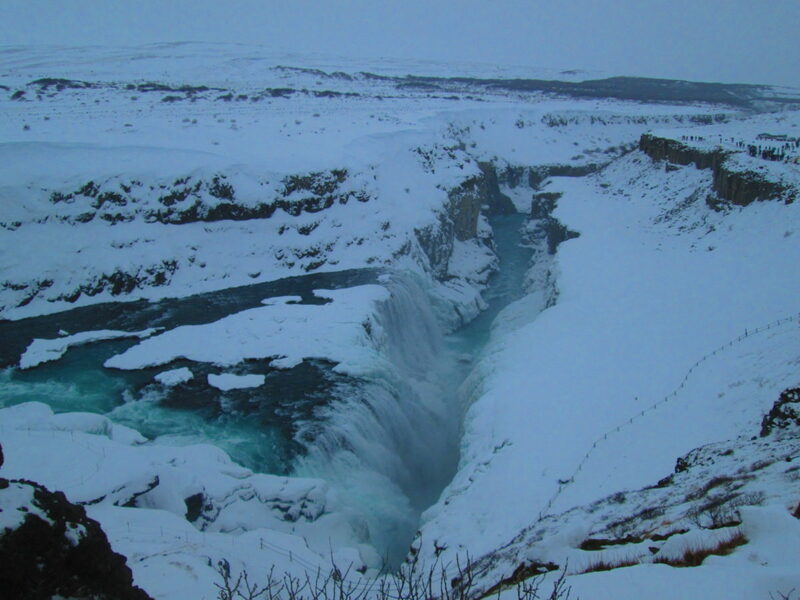 Next stop was Gullfoss which is located in the canyon of Hvítá river and it’s among the most visited ones. 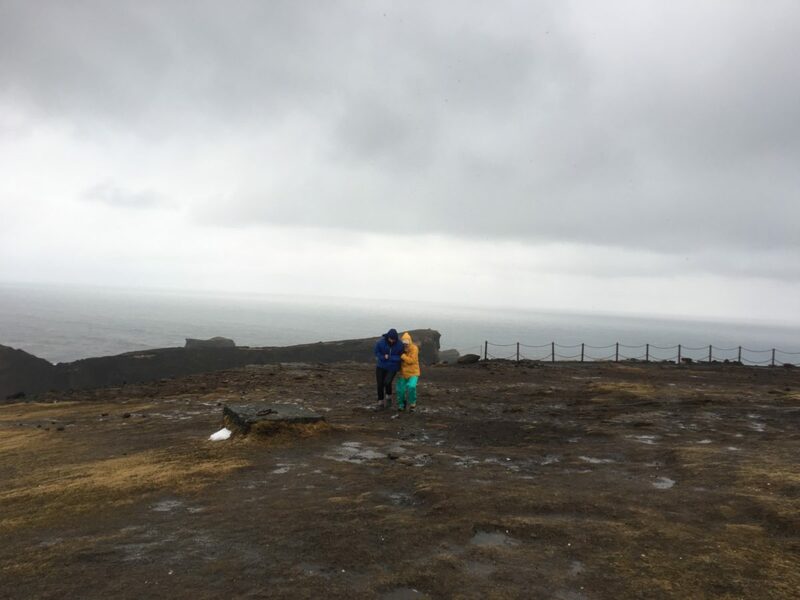 The winds around the viewpoints were strong enough to make some people stop and brace themselves so as not to be blown over. 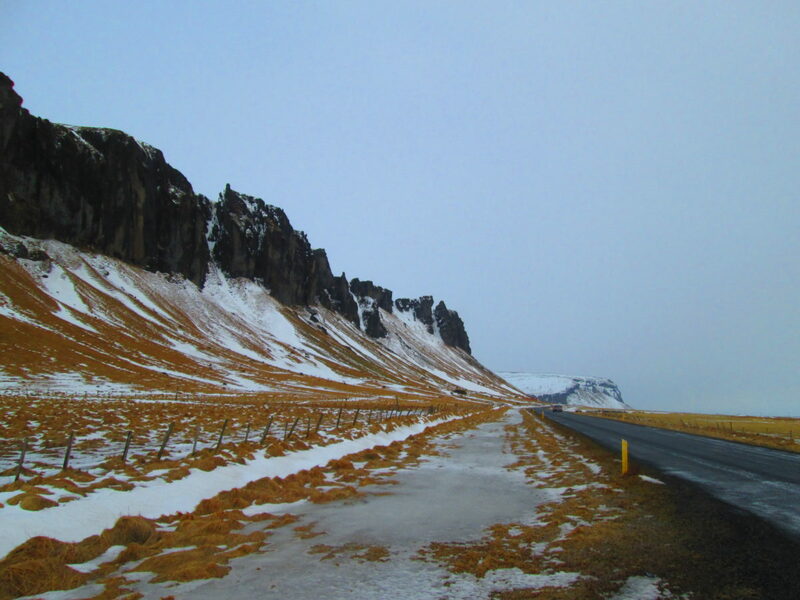 Strong winds are quite common in Iceland, so take extra care especially when driving. We didn’t stay long here because of the bad weather conditions and we continued our itinerary towards another waterfall. 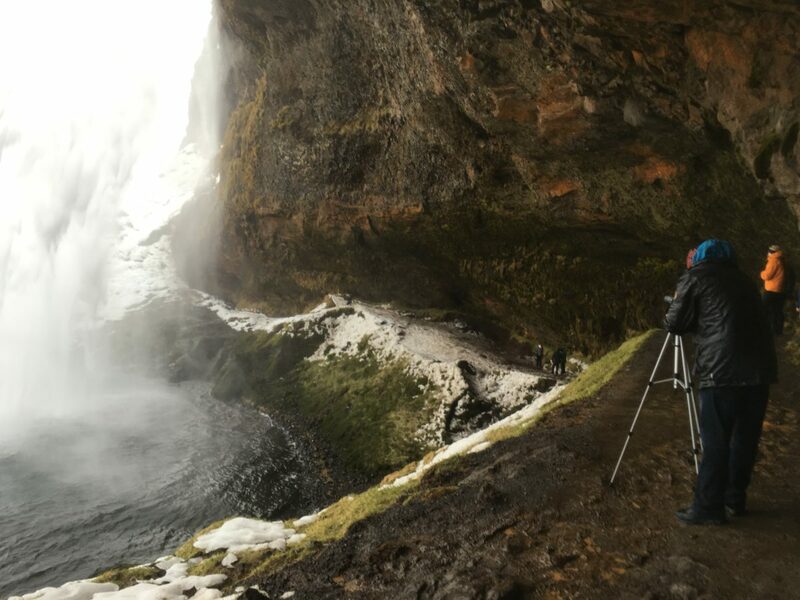 When we arrived here it was pouring outside and we could barely walk due to strong winds but somehow we managed to hike on the icy trail that took us behind the waterfall itself where we were able to absorb its grandeur. Behind the waterfall the winds calmed down so we were able to spend more time without being too exposed to the elements. Too bad that the light was not in our favour behind it but at least we will remember that moment for the rest of our lives as the first time we stepped foot behind a waterfall. 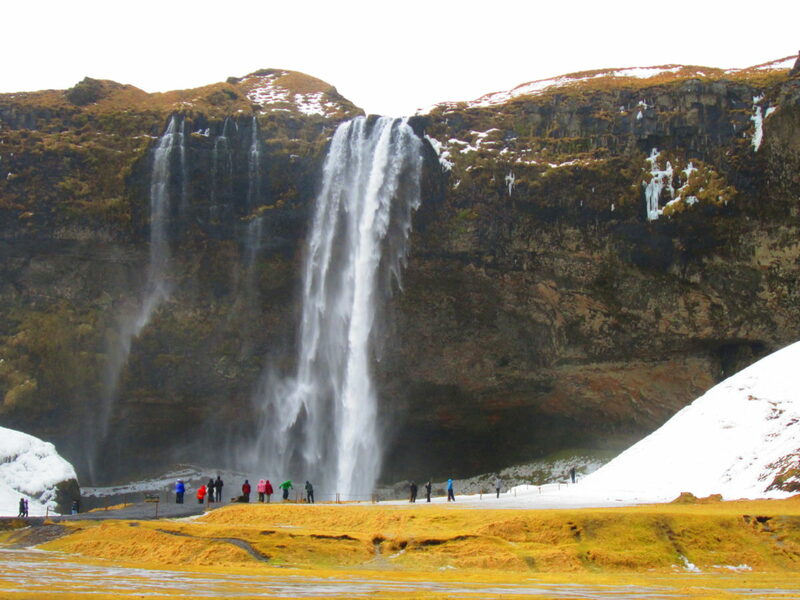 This is yet another beautiful waterfall which is not too far from Seljalandsfoss. 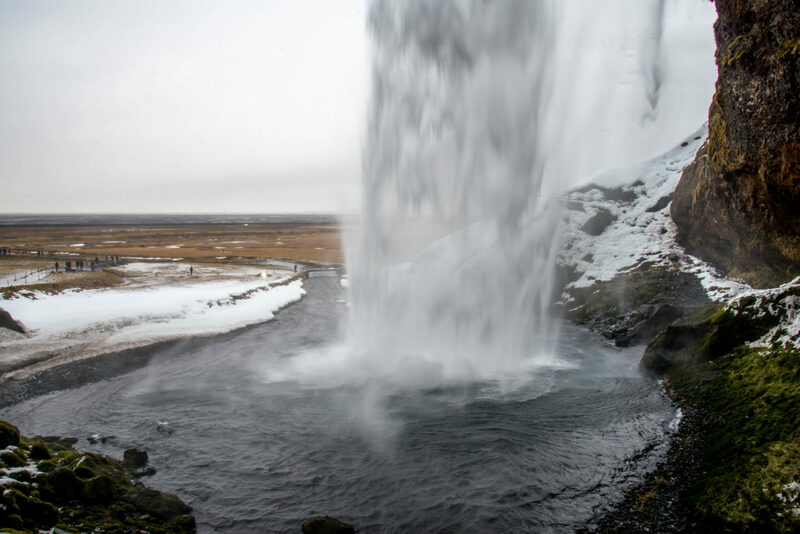 The waterfall itself is around 60 meters tall. You can go to the top on a wooden stairway for a point view but unfortunately at the time we were there ice was all over the stairs making it really dangerous, if not impossible without special equipment. Wet, hungry and tired we hit the road again, this time towards Vík where we had previously booked a room in a nice and cosy hostel (the only one in Vík). We had dinner at a restaurant near the hostel and then went to bed prepared for another day full of adventures. We woke up early in the morning, had some breakfast and we hit the road. 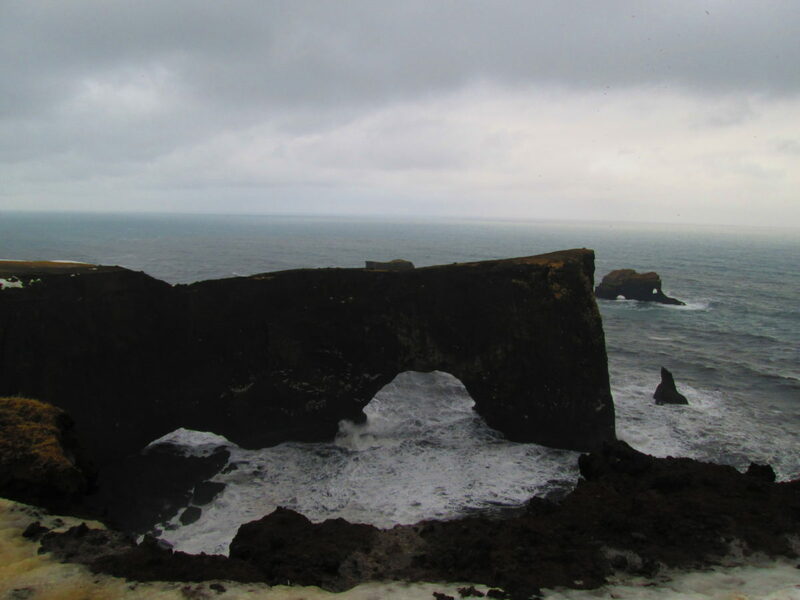 First stop was Dyrhólaey lighthouse and the natural arch which is the southernmost point in Iceland, but once again the strong wind was pelting us from all directions in such a way that we were barely standing. We took some quick photos and left for the next place. 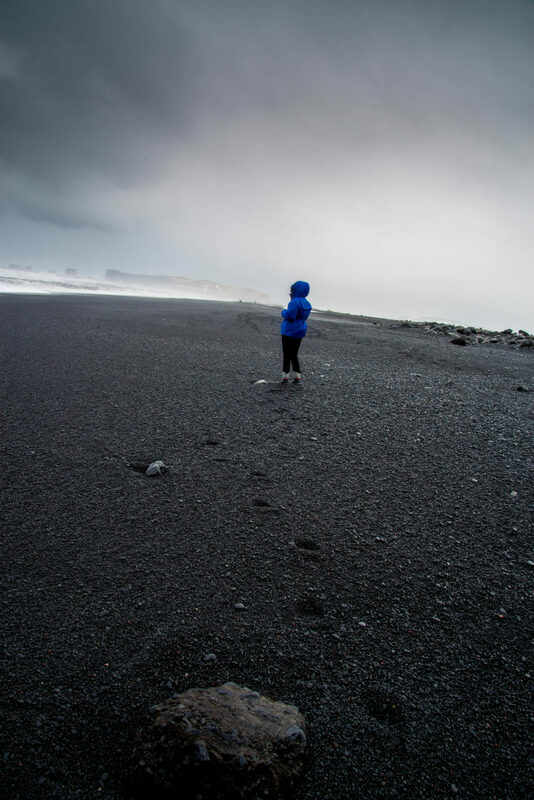 This is one of the most famous black sand beaches in Iceland and the first black sand beach that I’ve seen until then. 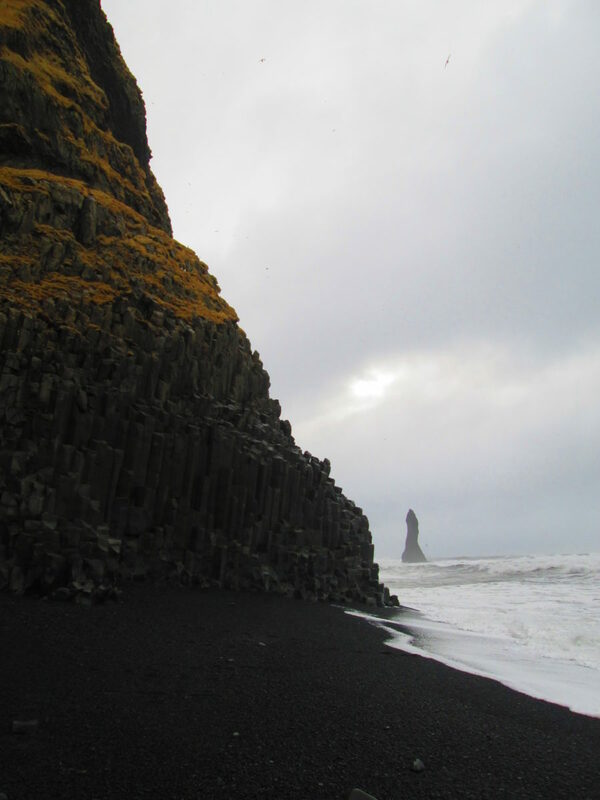 On the beach you can find columnar rock formations which according to the Icelandic folklore are thought to be the remnants of trolls turned in stone in the moment they were surprised by sunrise. From the parking lot as you enter onto the beach there are signs with “sneaker waves”. Seemed funny until we saw a poor girl being hit and knocked to the ground by a wave. 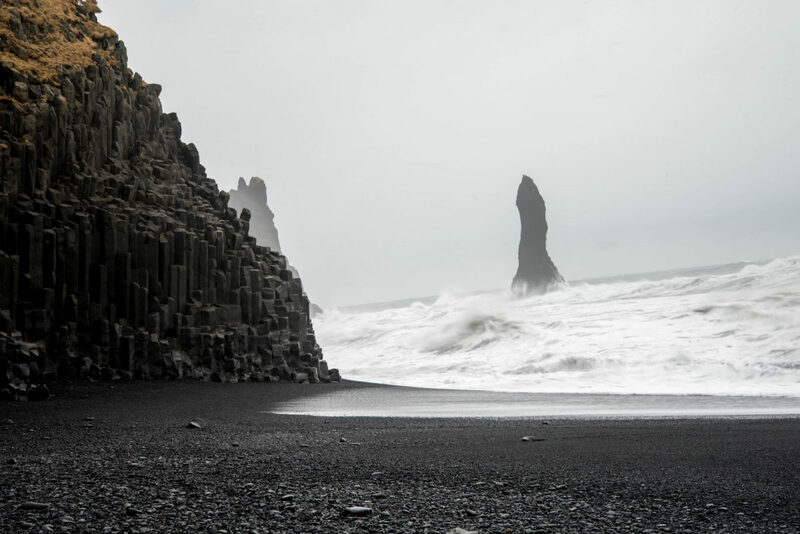 This is one thing to keep in mind while you are photographing the rock formations and the beach. The twisted US plane wreck is one of Iceland’s most iconic photography location, one that we missed since we (by we I mean us, girls) did not want to walk all the way to it since the locals recently decided to close the road for cars. Cristi still blames us for missing it but after all, something needs to be left for next time as well. 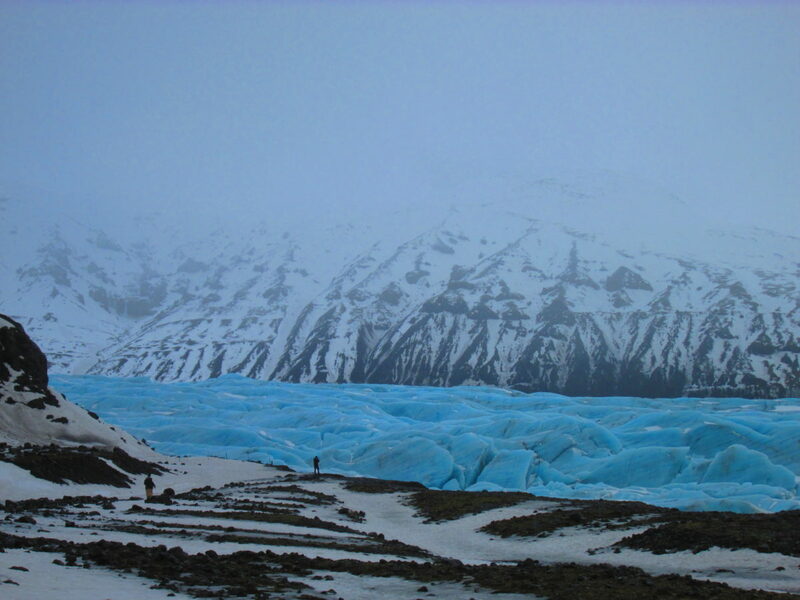 As soon as we arrived here we were amazed by the majestic fairy tale scenery, here we were for our first time in front of a glacier. The light blue colour was extraordinary, the atmosphere was serene and it was one of the most beautiful things we have seen so far. 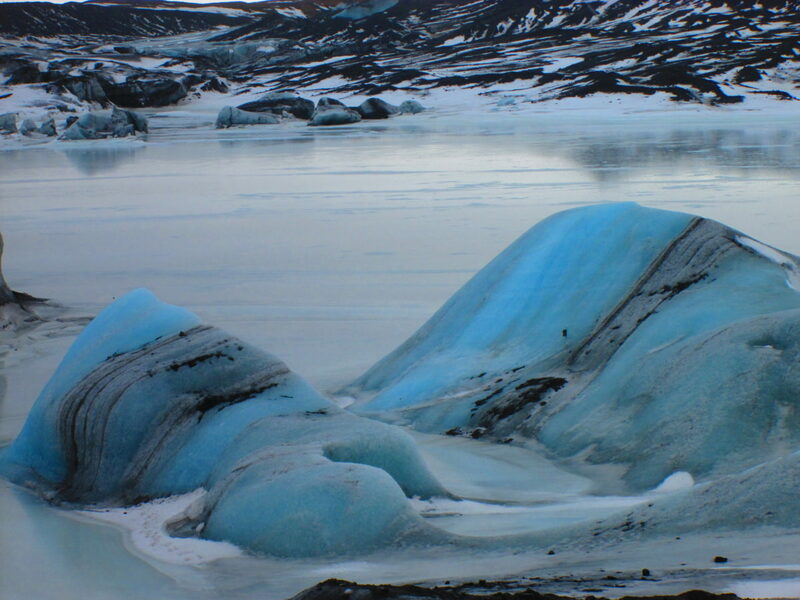 Here you can find blue-tinted icebergs breaking off from the glacier and floating in the lagoon. 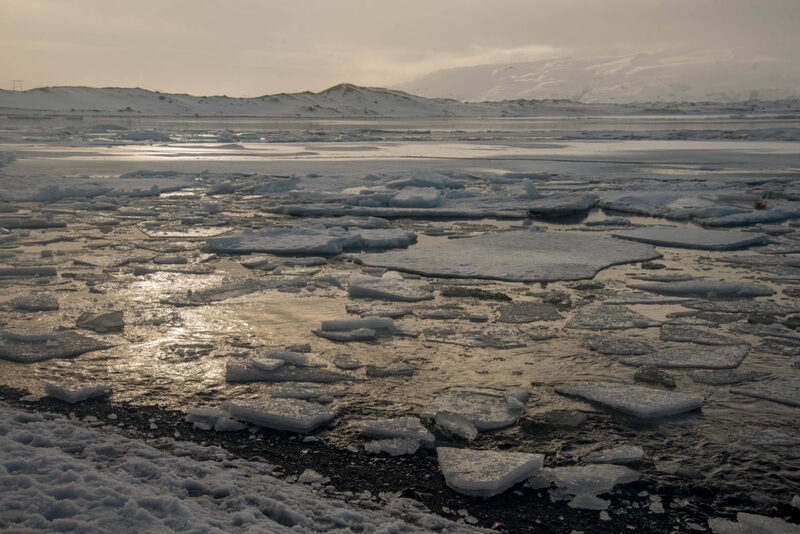 You can easily spend a few hours in here admiring the seals bobbing up and down or just laying on the floating ice on the lagoon. 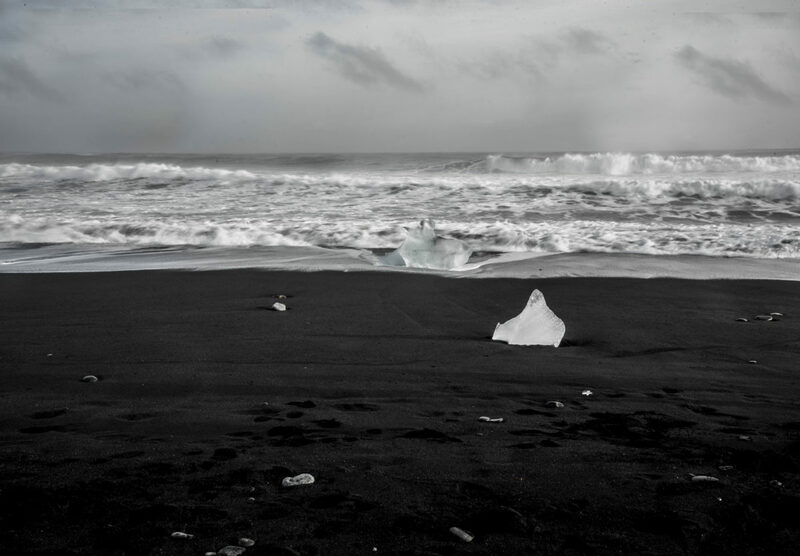 If you are here I will totally recommend to visit the ocean nearby where the glacial boulders are gathered on the black beach creating a perfect place for memorable pictures and memories. Just be careful not to be washed away by the ocean (see sneaker waves above). 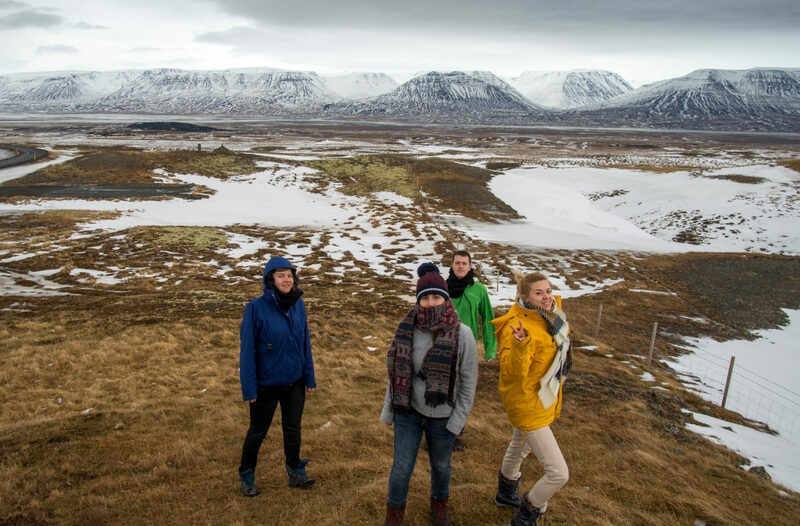 We headed up East towards Reyðarfjörður were we had our accommodation but we arrived late as we stopped to admire the scenery, the Icelandic reindeers and because we got stuck on the side road in the middle of nowhere. Even with the 4-wheel drive, our beast got stuck in the snow so we had to wait until another car passed to pull us out from the snow. Good thing we had a towing rope in the car. After we took a shower we decided to go out and hunt the colourful lights dancing in the night sky. 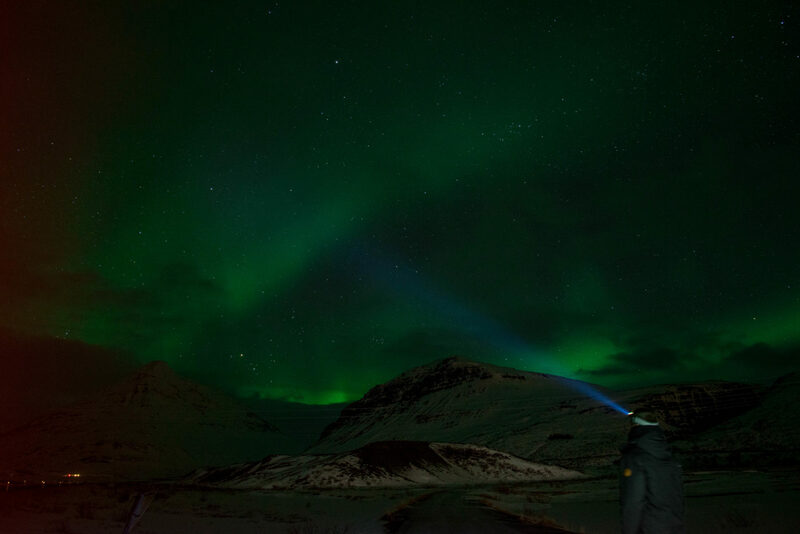 For us it was a priority to see for the first time the magic in the sky and we were daily checking the Icelandic website for aurora forecast. There we were, around 1am, outside the city chasing the Lights, waiting for the magic to begin. It started, but it was not as we expected it. 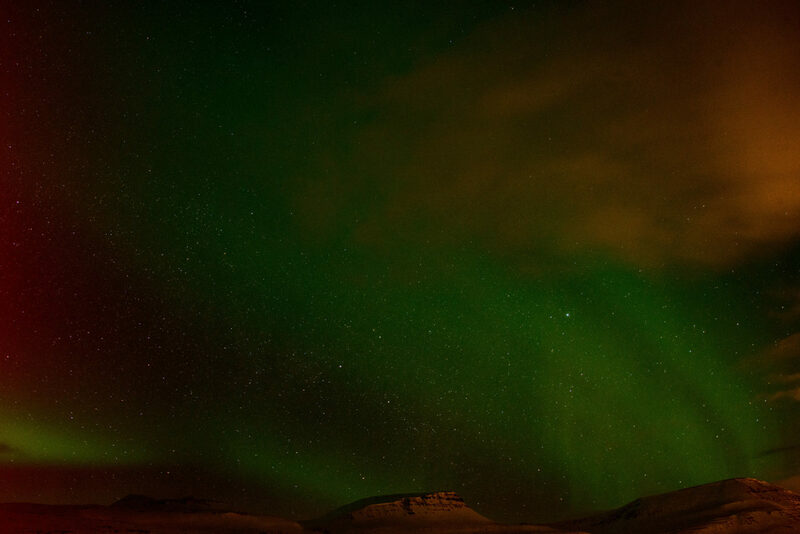 Since it was already March, the activity was weak, our much expected green-purple lights dancing on the dark sky were more like wispy clouds moving in the wind. 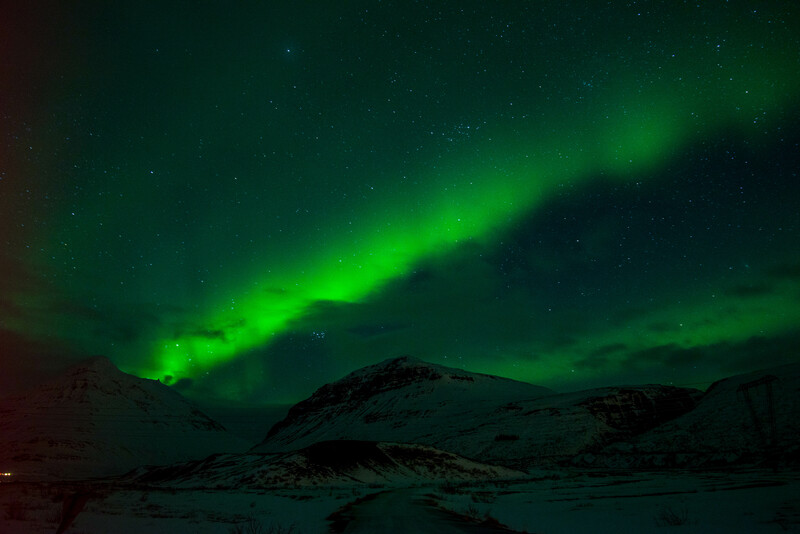 Cristi was prepared to photograph the Northern Lights and using long exposure photography he managed to transform the wispy clouds into green magic . This is another item on the list of things that remain to be (fully) seen. Our next destination on the list was Dettifoss, the largest waterfall in Europe by water volume but unfortunately the road was covered in snow and the access was at our own risk without insurance cover and if anything happens, it costs a fortune for rescue to reach you so we decided not to risk it. 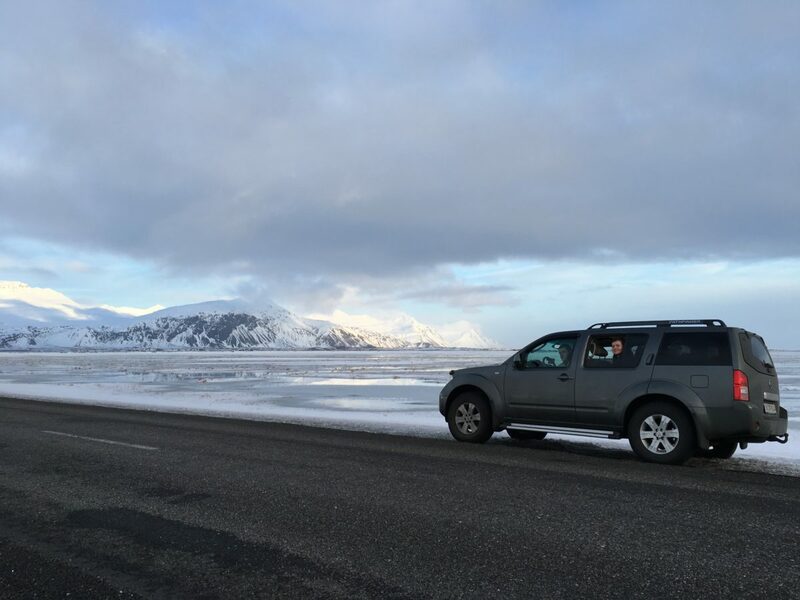 Even if we were a little bit disappointed, we hit the road again, this time towards Námafjall Hverir were we spotted some guys stuck in the parking lot and trying to clear the snow using a pan (ingenious, no?). Because we knew the feeling of being stuck we offered to pull them out with our beast. 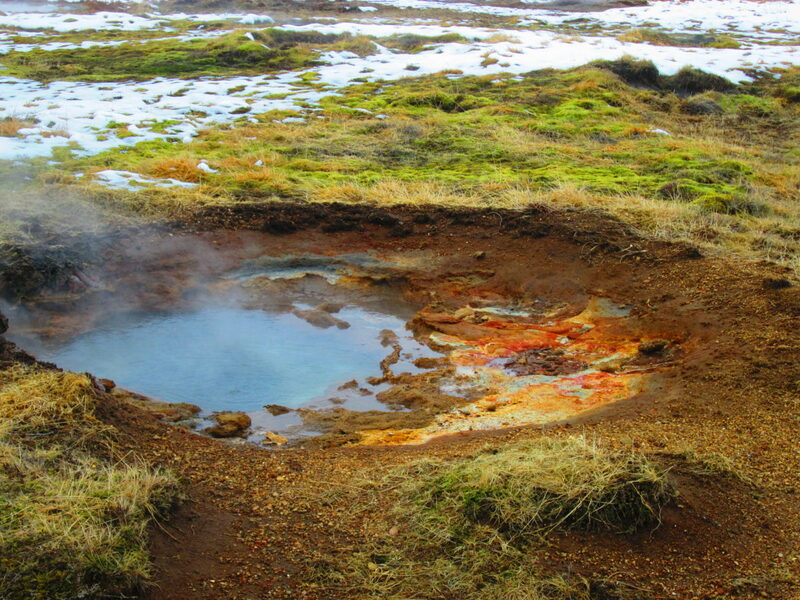 This area can be really smelly but it’s actually worth it when you get close to the boiling blue mud pits or steaming fumaroles. 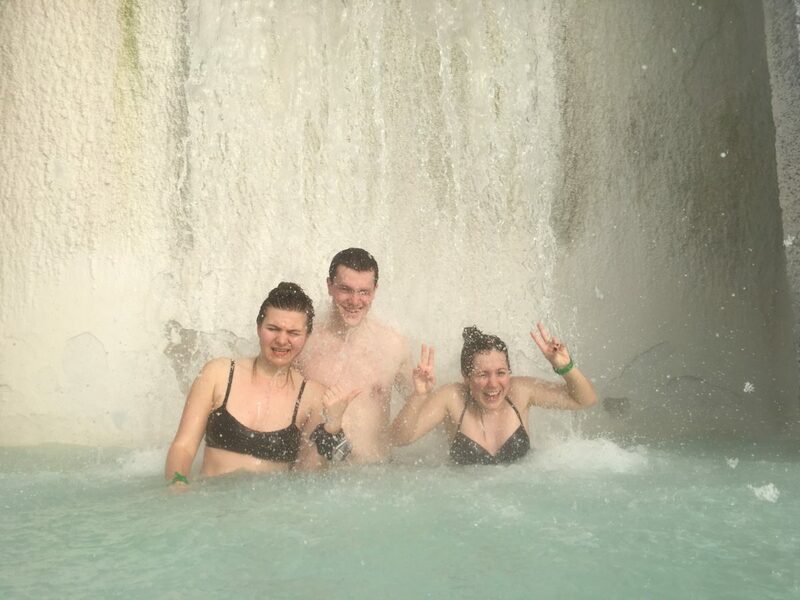 We walked around through the volcanic springs and we had red mud all over our shoes and trousers. We tried to clean our shoes in the snow before going back to the car. This was the moment when Cristi made a wrong step which ended in him waist-deep in the snow. We didn’t know if we should help him, laugh or take photos – we ended up doing the last two. 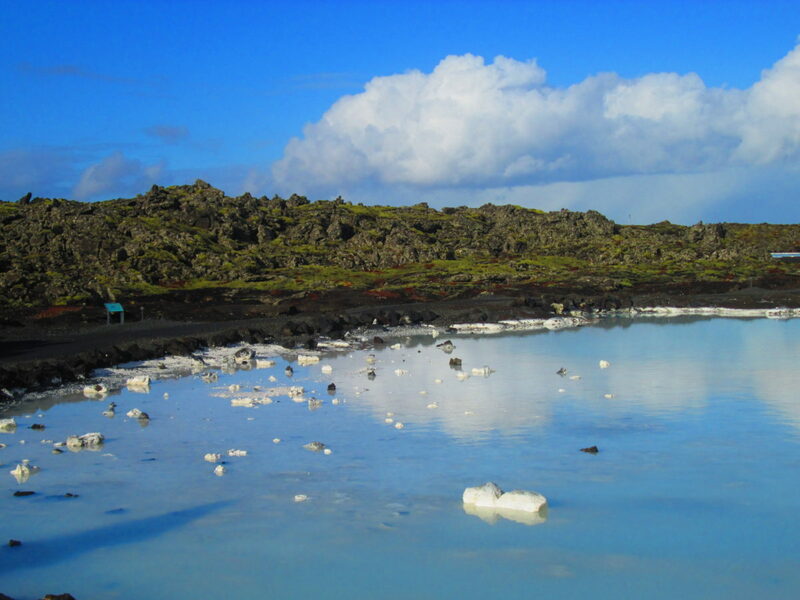 This lake is situated in an area of active volcanism not far from Krafla volcano. 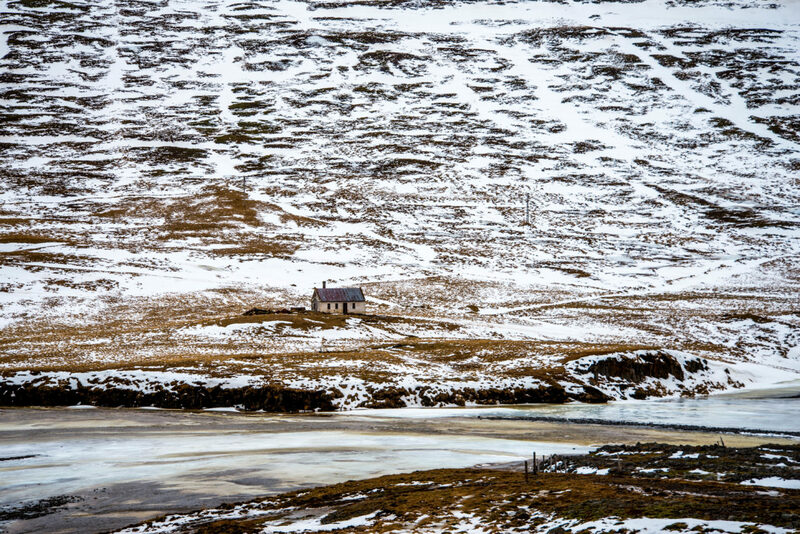 Due to the fact that everything was covered in snow, we weren’t able to see clearly the volcanic features that surround the lake but we stopped and we captured the starkly beautiful landscape in multiple pictures. I have to mention we passed right through the place where Fast and Furious 8 was being filmed (we only later found that out). I cannot wait to see the movie and say “been there, saw that”. 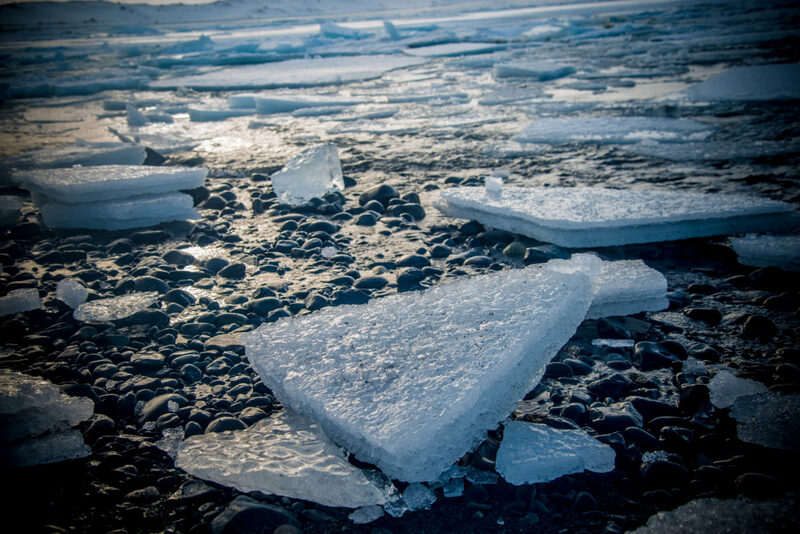 In Iceland the landscape changes frequently and you will be amazed by what Iceland has to offer even if you have seen it before in pictures while researching for your trip. 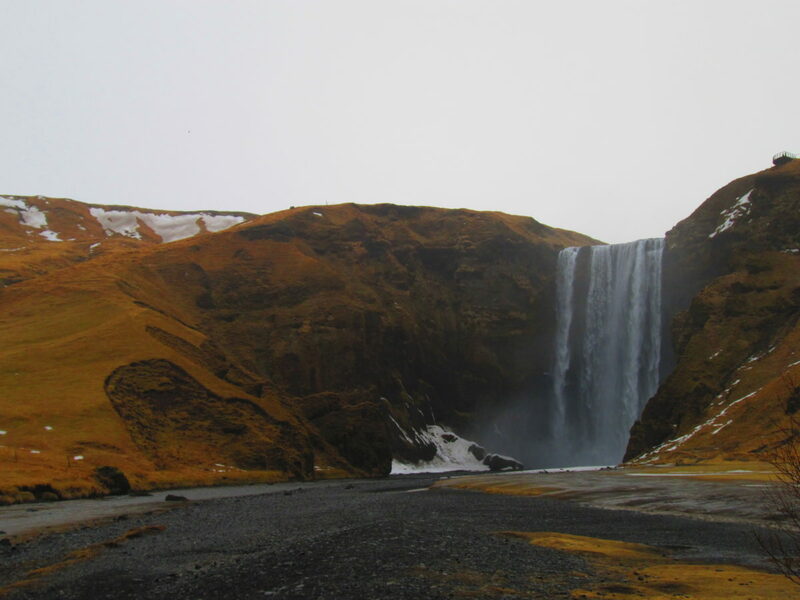 This waterfall which is located in the Bárðardalur district in North Central Iceland is just easily accessible through road 1 by farm Fosshóll. 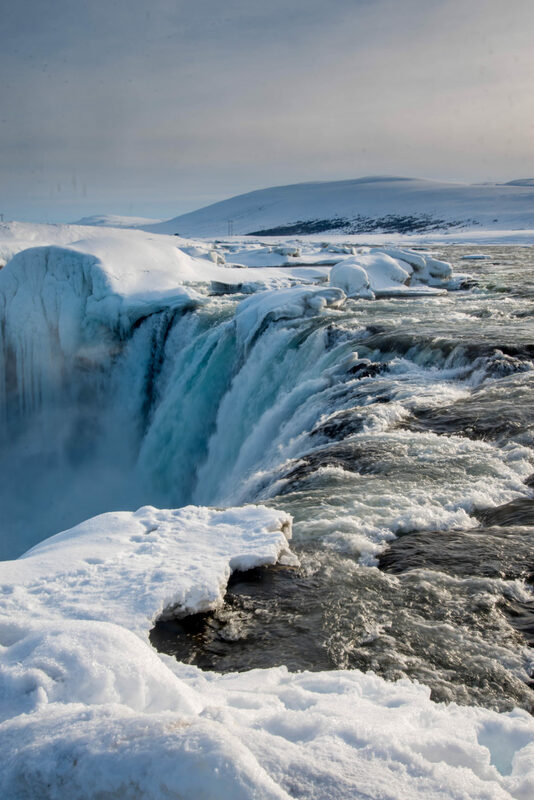 Goðafoss can roughly be translated as “the waterfall of Gods” and has been nominated as the most spectacular waterfall in Iceland. 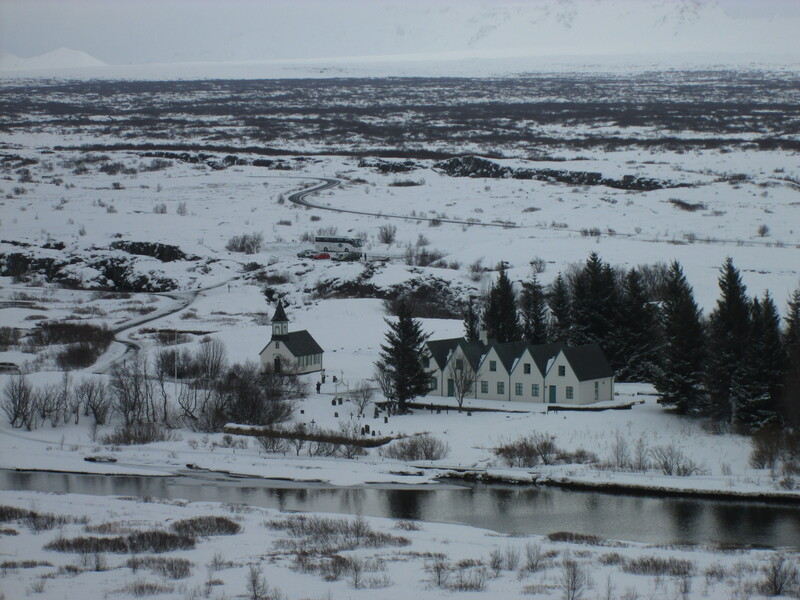 We spent enough time here to take multiple photos and to start shivering after which we headed off for the capital of the North, Akureyri. 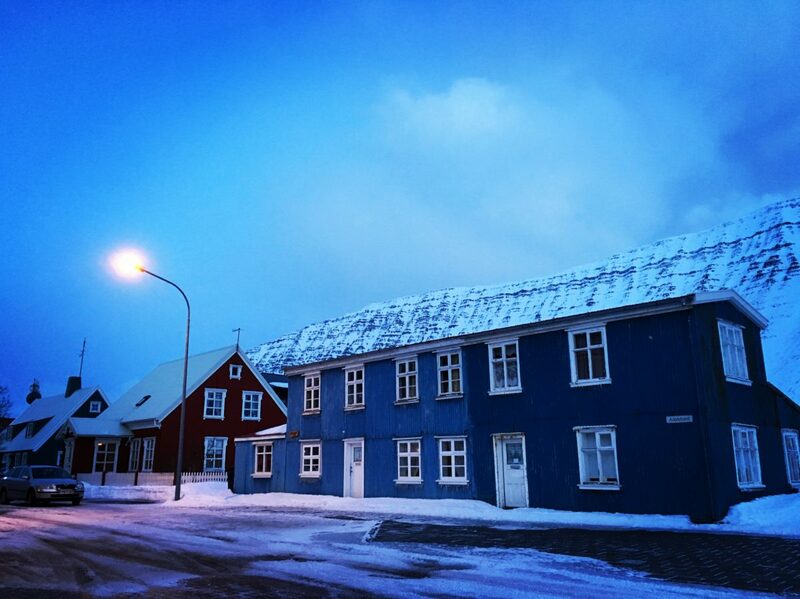 We arrived quite early in Akureyri so we had a bit of daylight left to see the city. 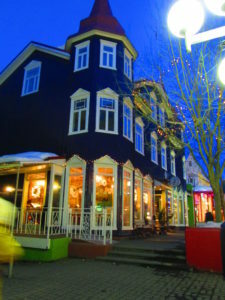 Akureyri is the 2nd largest city in Iceland and the capital of the North. We walked along the harbour and around the botanical garden and then decided to stop at a nice restaurant to fill our stomachs for the first time with whale and catfish which by the way were good but I cannot say extraordinary. 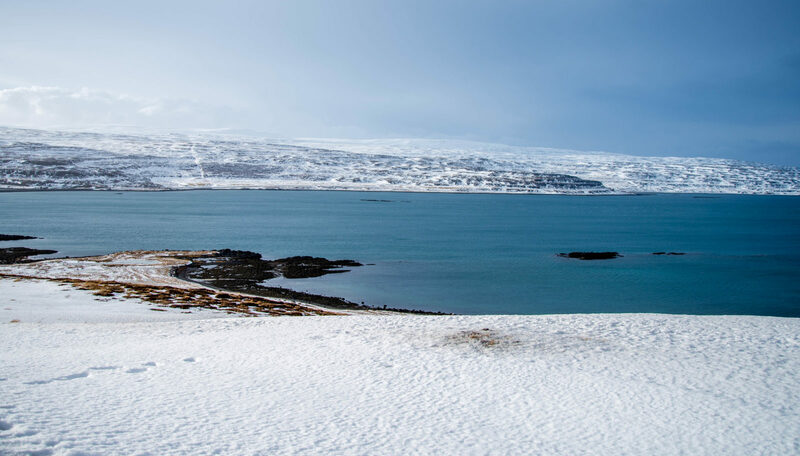 We included in our trip the Westfjords as well – a destination visited only by 14% of the total number of tourists in Iceland. The weather was harsh as we went through a snow storm, driving with around 10-15 km/h for roughly 20km since we were barely able to see the road in front of us. 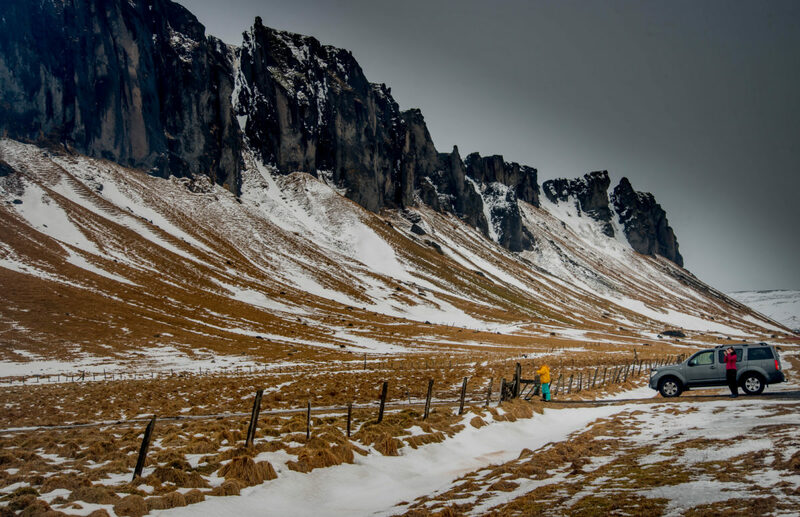 With no reception, no visibility and no snow chains it made the perfect scenario for a horror movie. 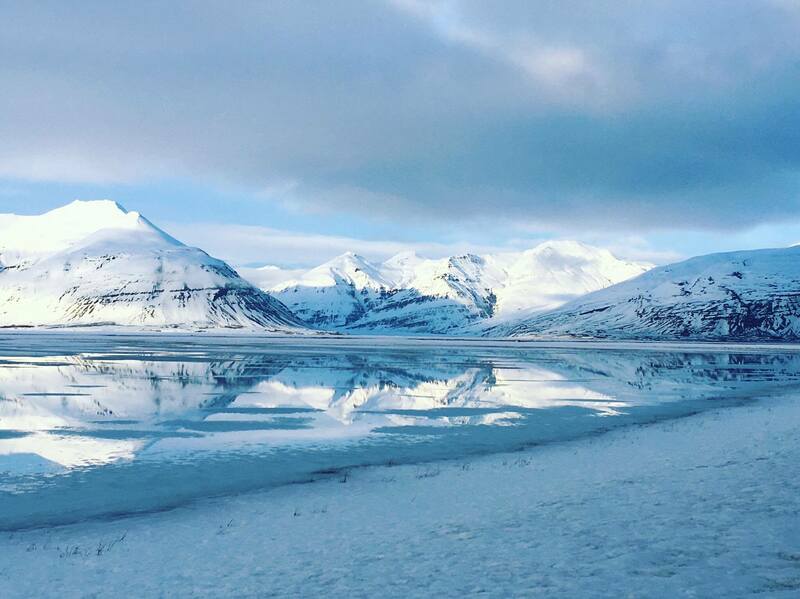 Somehow we managed to drive through it and continued on our way through the idyllic fjords were the weather was tricky as well – wind, snow, hail and so on but luckily for us we arrived safe to our final destination. This small town had something apart, it seemed so peaceful with colourful houses and chill atmosphere. We had time to visit the harbour and the old part of town before stopping for dinner at a restaurant. 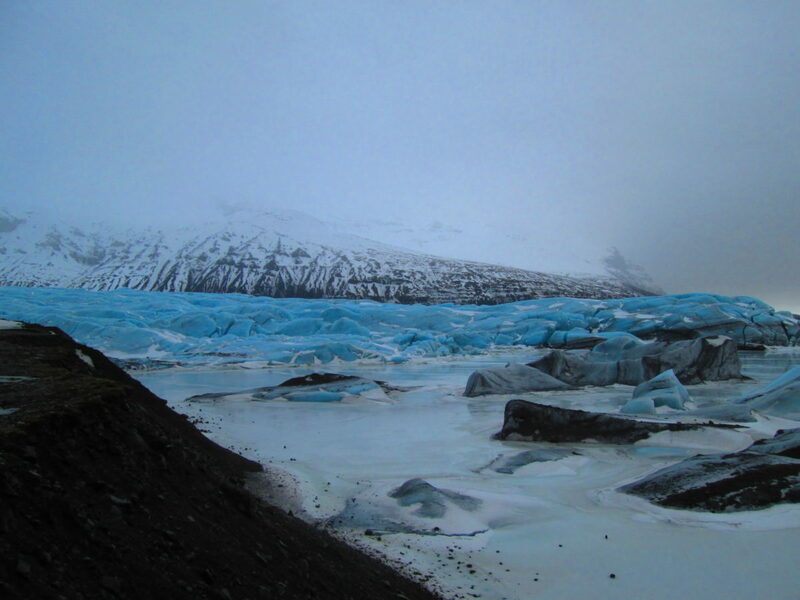 Cristi loved this part of Iceland and he wants to spend an entire winter there sometime in the future. I personally believe this is going to be too cold for me so as I see it now, the chances of him going alone are quite high. 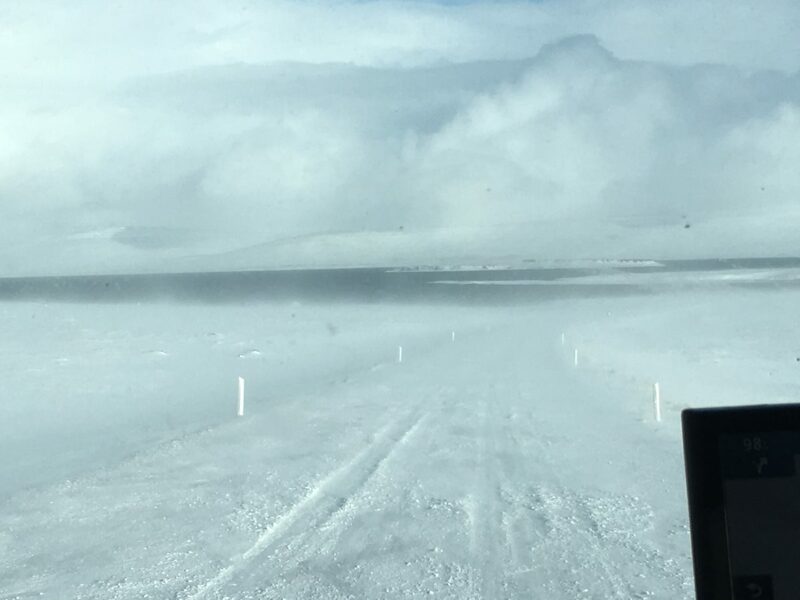 Remember to take extra care while driving as this part of Iceland can be very windy. 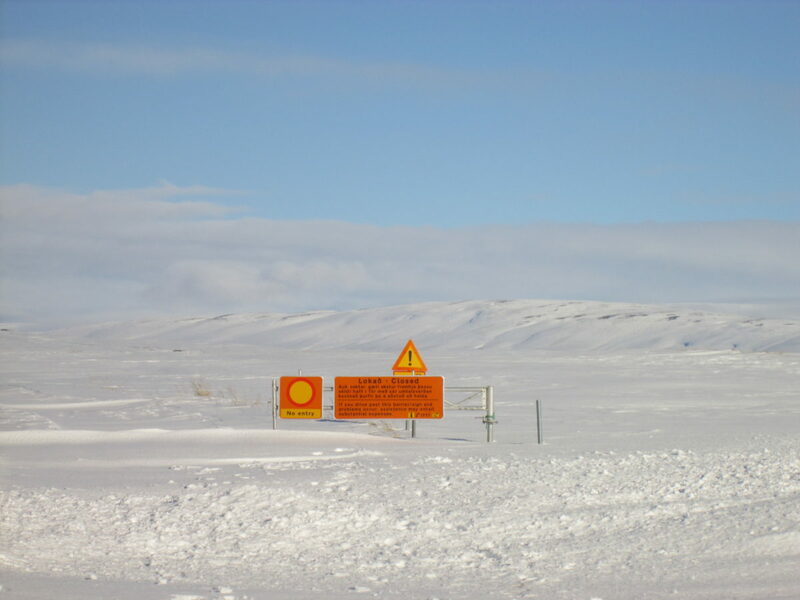 First thing we checked next morning was the real-time road conditions on Vegagerdin.is to see which roads are closed due to snow storms. The forecast was not in our favour but we had to hit the road as Gabi had her plane Saturday early in the morning while ours was later in the afternoon. The roads were the same as the day before but the portion through the mountains was a little bit better than last time. 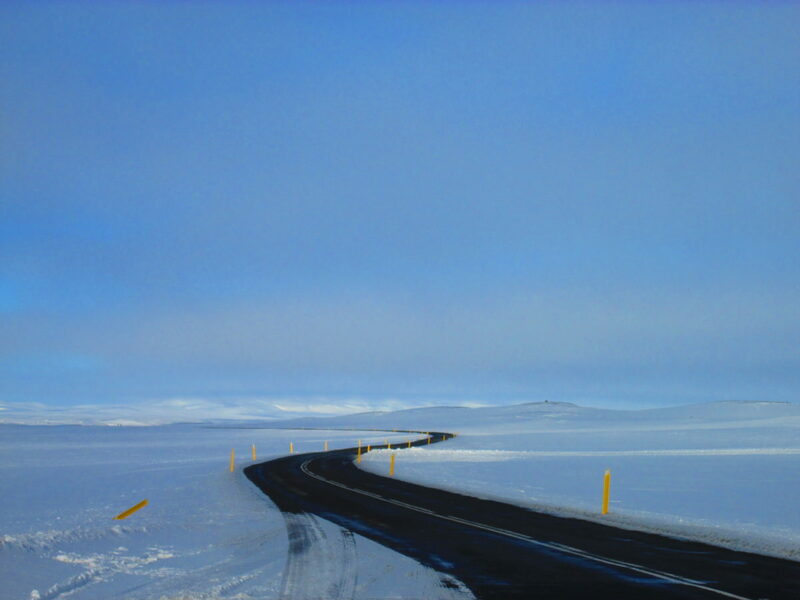 To get back to Reykjavik after our road trip was a little bit disappointing – the nature and the wilderness were gone. For our last night together we decided to go to a restaurant and talk about our trip, share opinions, what we liked, what we didn’t liked and of course agree that next time we will spend more time in Iceland in order to visit all the places that we’ve missed. 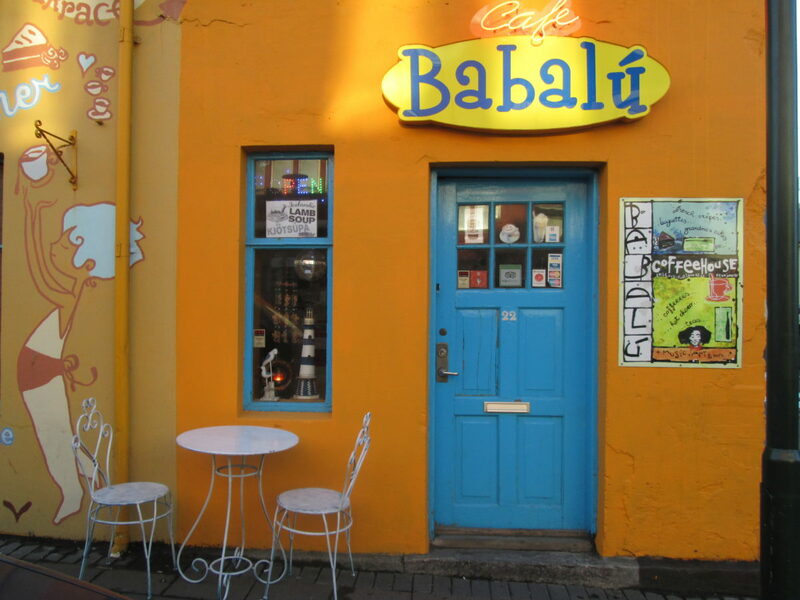 The next morning we took Gabi to the bus station and we continued to explore the streets of Reykjavik. We had to taste before leaving the Kæstur hákarl which is the national Icelandic dish aka fermented shark. The taste was acceptable, mostly like fish but the rotten smell was extremely strong. If you do decide to try it, I totally advise you to pinch your nose while tasting the first bite as the smell is much stronger then the taste. After several hours the three of us took the bus to the airport and this was the moment when I came up with the idea of creating a blog, more specifically this blog. We shared with Lia the idea and we start looking into names for this blog while we were waiting for our flights. The actual name came weeks after this trip was ended, though. 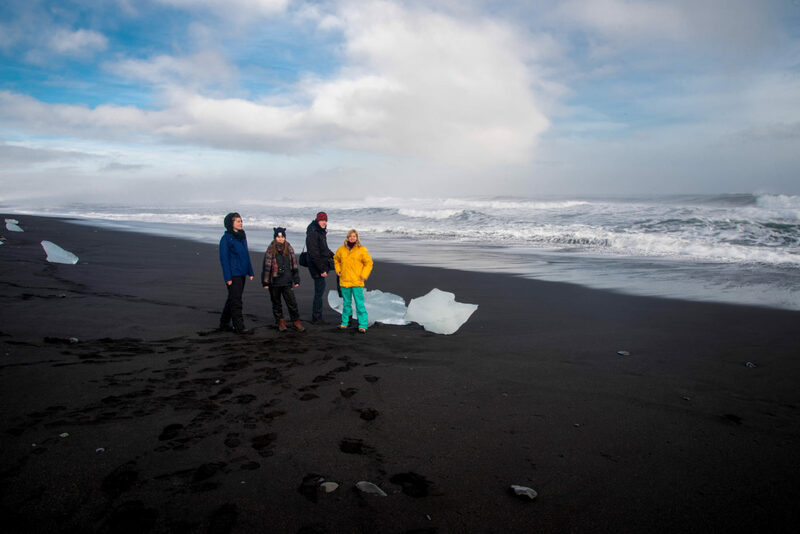 As a final conclusion, Iceland was the place were we had lots of “first times” and we couldn’t be happier for choosing this location for an unforgettable experience, we definitely lived the Icelandic dream and we are willing to go back and visit it again and again. 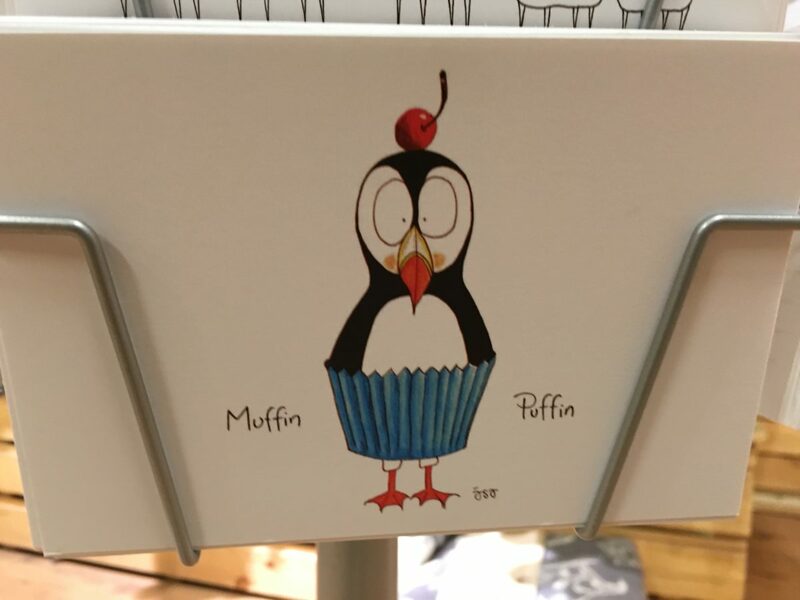 On our to-do list for next time are the northern lights (proper ones), Grímsey (the only part of Iceland inside the Arctic Circle), puffins, plane wreck, flight over an active volcano and other missed waterfalls. Excelenta calatoria! Felicitari! Nu ati intrat deloc pe interior din lipsa de timp? Mulțumim pentru timpul acordat. Daca va referiți la centrul Islandei, nu l-am vizitat pentru ca nu am avut suficient timp. Chiar si asa majoritatea drumurilor marcate “F” sunt deschise doar vara. Cu toate astea speram sa ne întoarcem curând, de data asta pe timp de vara. 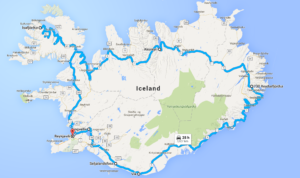 La sfarsitul unei ture in Groenlanda, am mai incercat o data F roads in Islanda, in ciuda faptului ca am avut doar doua zile la dispozitie. In mod sigur se merita si o a treia incursiune.